The larger auroral oval relative to the modern is the result of a weaker magnetic field and stronger solar wind. The auroral intensity is brighter due to solar wind densities many times greater than those today. The protective magnetic field shrouding the early Earth waslikely only half as strong as it is today, a new study suggests. 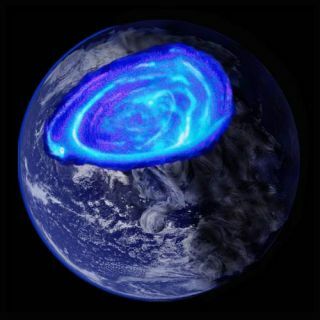 The research also found that the Earth's magnetic field is 200million years older than previously thought, which has implications for theamount of water that was originally present on the early Earth, and perhapseven on the development of life. Such a weak field in the Earth?s early days mayhave also made for some spectacularauroras, or Northern Lights, at latitudes as low as what is now New YorkCity, researchers said. Earth'smagnetic field is generated by the turbulent, convective motions of theplanet's molten core. The field extends around the Earth for quite somedistance into space until it meets the sun's incoming solar wind (the stream ofcharged solar particles constantly flowing away from the sun). The boundarywhere the two meet is called the magnetopause. It is the magnetic field that protects the Earth's surface,and all of its inhabitants, from this energeticsolar radiation, which would harm living organisms and strip away much ofEarth's atmosphere (Mars has no significant magnetic field, which is thought tobe the reason it has such a miniscule atmosphere). But little is known about the magnetic field as it existedjust after the Earth formed, around 4.5 billion years ago. To learn more aboutthis early magnetic field, John Tarduno of the University of Rochester and hiscolleagues from the University of KwaZulu-Natal in South Africa, turned to thecrystals in ancient rocks that preserve magnetic signatures. Certain igneous rocks called dacites contain smallmillimeter-sized quartz crystals, which in turn have tiny nanometer-sizedmagnetic inclusions that act as mini compasses, locking in a record of theEarth's magnetic field at the time that the dacites cooled from molten magmainto hard rock. To look for preserved records of the early magnetic field,Tarduno and his colleagues used the best preserved grains from 3.5billion-year-old dacite outcroppins in South Africa, some of the oldest rocksknown to still exist on the Earth's surface. Using a specialized magnetic detector, the team found thatthe 3.5 billion-year-old crystals in the rocks recorded a field that is about30 to 50 percent weaker than the field that exists today. The finding isdetailed in the March 5 issue of the journal Science. Some scientists have suggested that there was no magneticfield on the early Earth, so this result "demonstrates that there was afield at that time," Tarduno said. This weaker magnetic field also has implications forconditions on the early Earth. Because "the magnetic field stands off the solar wind,"Tarduno says, it keeps solar particles from eating away at the molecules in Earth'satmosphere. But in the past, not only was this field weaker, the sun waslikely rotating more rapidly and therefore spinning off a stronger solar windand a magnetopause that was likely much closer to Earth ? today it is at adistance of about 10.7 Earth radii, but then it would likely have been around 5Earth radii out (Earth's average radius is about 4,960 miles, or 6,370 km). The solar wind situation on the Earth at the time may havebeen something like the Halloween solar storm of 2003, which affectedsatellites, communication, air traffic and power generating systems. "That means that the particles streaming out of the sunwere much more likely to reach Earth," Tarduno said. The implication ofthat situation is that "it's very likely the solar wind was removingvolatile molecules, like hydrogen, from the atmosphere at a much greater ratethan we're losing them today," he said. And the loss of hydrogen implies aloss of water as well. In turn, if a lot of water was stripped away early in Earth'shistory, to get the amount of water that we have now, the planet must havestarted "with a fairly robust inventory of water," Tarduno toldSPACE.com. Both water and a protective magnetic field are essential tothe development of life as we know it, so the finding also has implications forunderstanding how life arose on our own planet, as well as potential lifebeyond on our solar system. Tarduno and his team's study "suggests that themagnetic field may predate the establishmentof life" on Earth, wrote Moira Jardine, an astronomer at theUniversity of St. Andrews in Scotland who was not involved with the study, inan essay accompanying the new study in Science. The development of magnetic fields around other planetsoutside the solar system and how well they guard any potential life is alsosomething to consider when looking for planets around young stars, which seemto have stronger solar winds and more frequent solar storms than the sun doesnow, Jardine wrote. It also means that to evolve an extrasolar planet that isEarth-like, "we need to start with a fairly healthy inventory ofwater," Tarduno said. The weak magnetic field on the early Earth may have also ledto much more spectacular, possibly extending over an area three times the sizeas they currently do and extending to lower latitudes, possibly as far as thecurrent position of New York City. Auroras are the light shows generated whensolar particles are funneled down the polar axes of the magnetic field andinteract with atoms in the Earth's atmosphere, exciting them and causing themto give off photons of light.